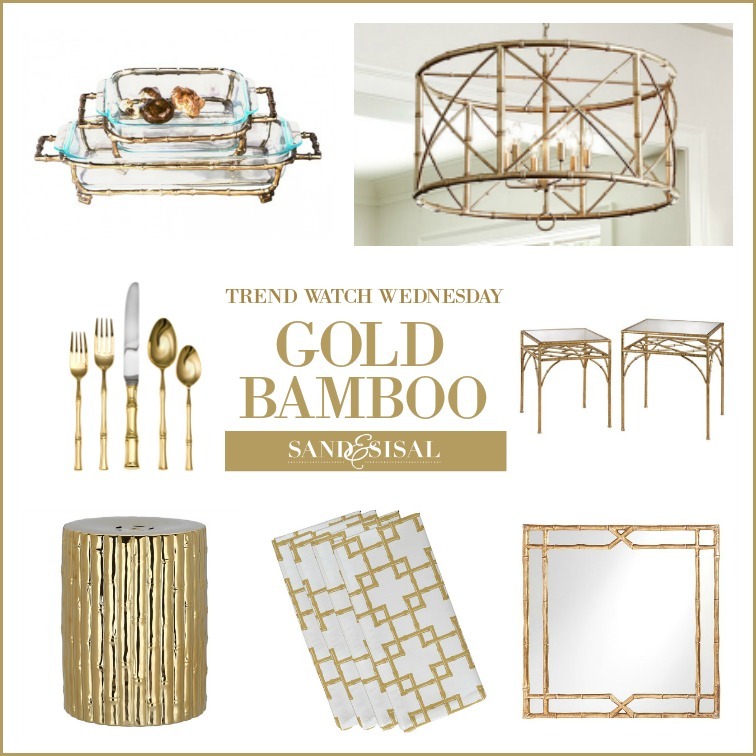 Welcome friends to Trend Watch Wednesday – Gold Bamboo! I seriously never thought that I would love gold, let alone gold bamboo as much as I do. For many of you, including me, the word gold in home decor brings up opulent images of gawdy 80’s brassy finishes and flashbacks of Miami Vice reruns. Am I right or am I right? When I moved into this home I immediately spray painted every shiny gold brass doorknob oil rubbed bronze or brushed nickel. Who knew that not even a decade later I’d be somewhat rethinking that decision? Now I am embracing softer shades of gold like brushed bronze and champagne gold. Trends come and go but when you work in this design industry you have the insider luxury to see what is coming on the horizon. I have been watching several trends that are becoming mainstream, which means they will have lasting power and will not be fading away anytime soon. When mainstream markets like Target and Walmart start showcasing the trends then that is the key indicator that the trend is most likely here to stay. The mainstream markets have been featuring gold and bamboo products for actually almost 2 years now! Two years already! 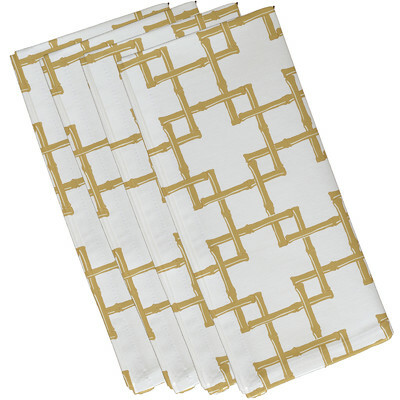 Gold bamboo is gorgeous and is a lovely addition to any chic, hampton style coastal home. The bamboo motif lends itself to a relaxed, coastal island feel and the range of gold sheens add a touch of glam to any space. Take a peek at these subtle and classy gilded touches that you might be interested in adding to your decor. Click the affliate links in the description above each photo to find out where the item can be purchased. 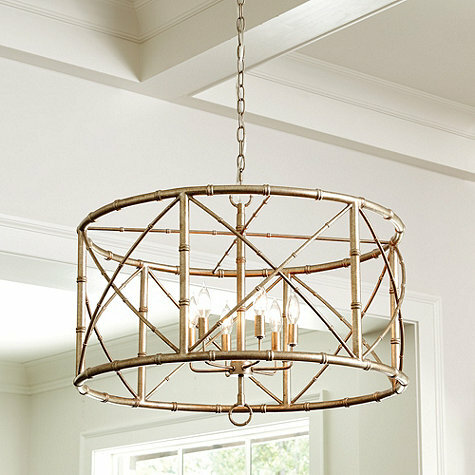 This gorgeous champagne gold bamboo chandelier will be soon residing over my kitchen table. It is a birthday gift from hubs and it will coordinate perfectly with the brushed gold pendants I have hanging over my kitchen island. (Look for the intallation post soon!). Mirrors are one of the easiest ways to add a touch of gold and glam to any room. 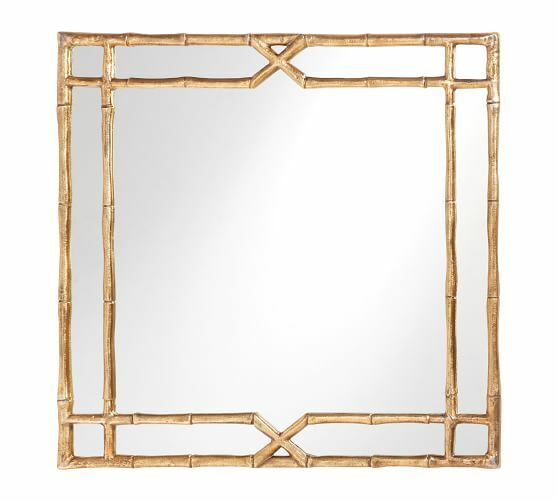 This lovely gold bamboo mirror is from Pottery Barn. 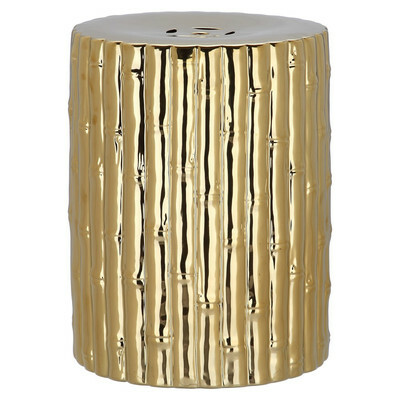 I’m crushing over this gold bamboo garden stool! Wouldn’t this be an unexpected addition to a poolside patio or in a living room for extra seating? 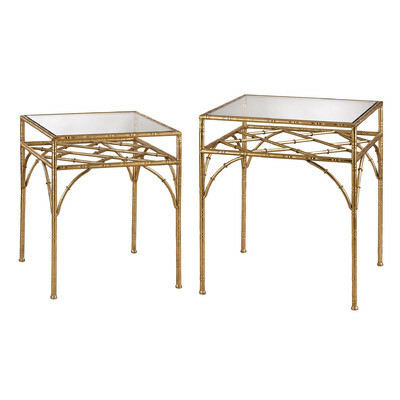 These gold bamboo side tables would look fabulous in any familyroom. The glass tops, sleek lines, and open bamboo shelf provide for a side table that won’t take up an abundance of visual space in your room. 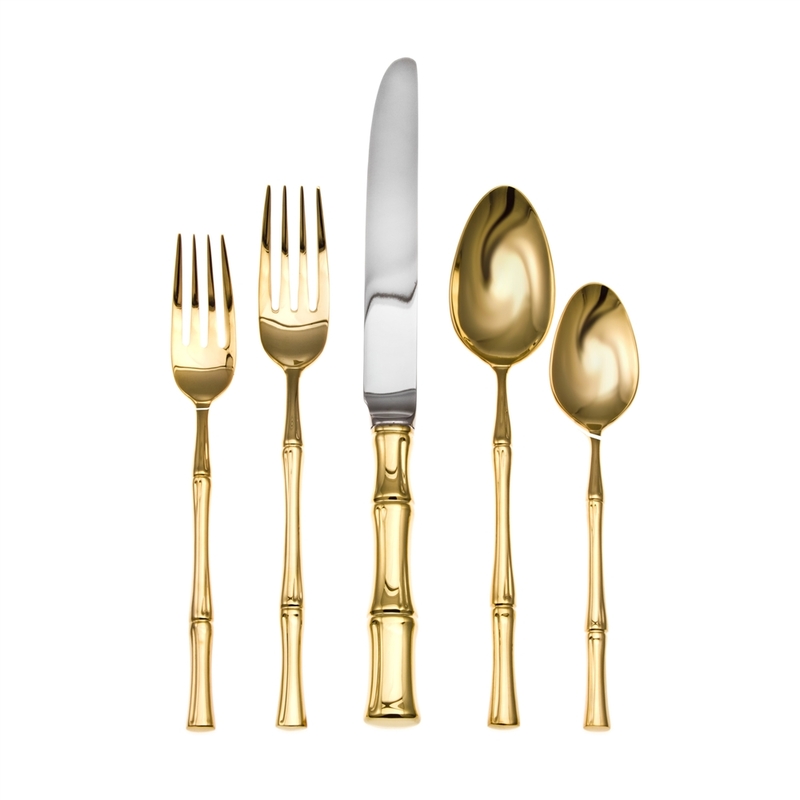 I just purchased a set of gold flatware this past Christmas and I love how they elevate the look of any tablescape. This gold bamboo place setting is a quite a bit pricier than mine but wow isn’t it absolutely beautiful? 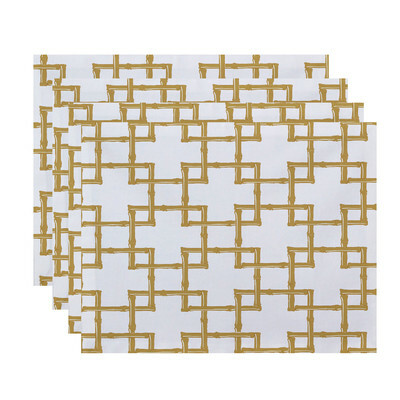 For those of you who aren’t quite ready to embrace the gold, ease into the idea with some gold bamboo placemats and gold bamboo cloth napkins! 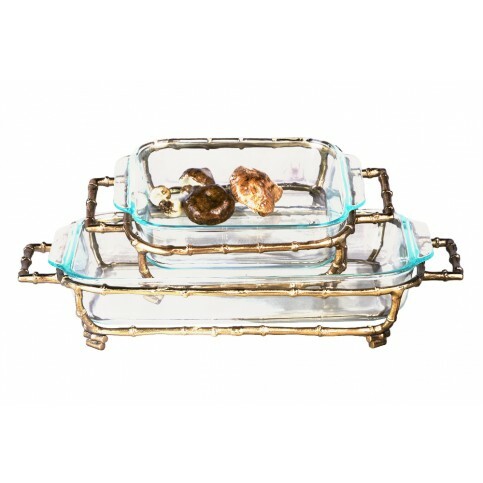 Be the talk of the party when you waltz in with these amazing gold bamboo Pyrex dish holders. 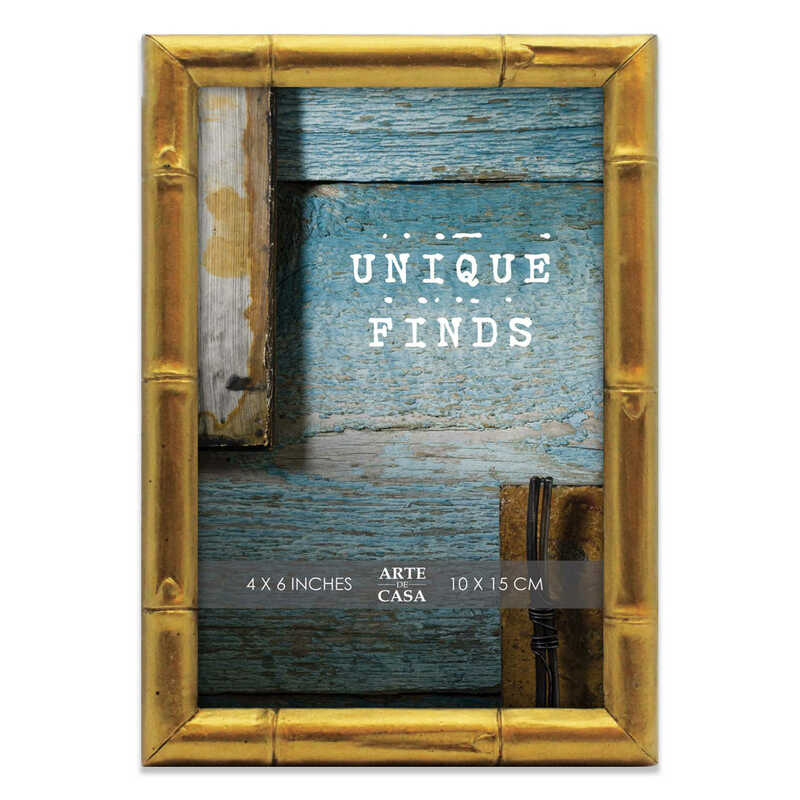 Showcase your sweety by framing them with a gold bamboo picture frame. 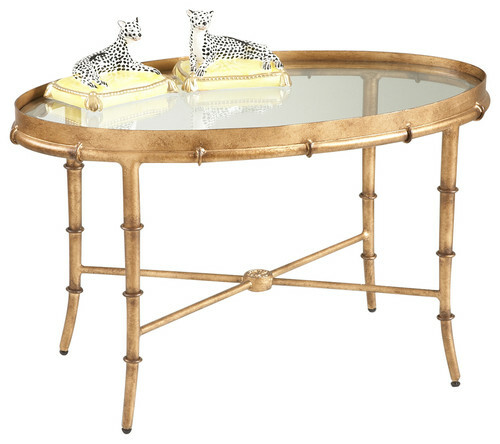 This gold bamboo cocktail table has such a lovely oval shape and the glass top creates a nice open feel. I personally would ditch the leopards and replace them with a pretty plant instead. Lighting is one of the most classic ways to bring gold decor into your home. These gold leaf bamboo sconces are simple and elegant. They would look beautiful flanking a bathroom mirror. Did any gold bamboo home decor items catch your eye? Twice a month I’ll be showcasing the trends that I think you will love! Have a fabulous day! These are all beautiful pieces, Kim. Thanks for opening my eyes to “GOLD”. It’s so warm compared to silver, which i still love but now I’m really leaning towards the gold ! (. I felt the same way at first Diena! I first started bringing in small accessories in gold a few years ago and now I love it. Just as in all things, moderation is the key. 😉 Too much silver is overwhelming just as too much gold. Have a fabulous week! 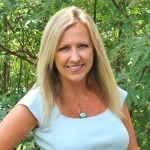 Fun to see your post! When we were at the market in Atlanta in January, we saw so many cool gold accents. I think they give a room a warm glow and work wonderfully with coastal navy blue and aqua shades.